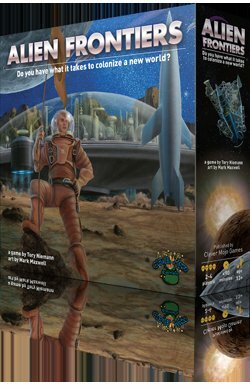 Alien Frontiers is a game of resource management, worker placement, and area control set in a retro-future scifi universe. I have never played Kingsburg, but this game gets compared to it a lot around where I play (and nearly always in a good way). This game will appeal to those who like the challenge of maximizing the resources (ships, aka dice) that you get during your turn. Those players who like to have complete control over their chosen path to victory will be disappointed as the dice will sometimes make you change your plans. I always try to base my opinion of a game on one question: Is it fun? When playing this game, I feel like I'm in (or watching) an old Sci-Fi movie...... that on top of the interesting choices and healthy does of luck make it so I never try to take it (or myself) too seriously in this game. Pick up this game if you like dice, like the Sci-Fi theme, or if you want a medium weight game to play with 1-3 others. Fun Game! Game goes fairly quickly and is easy to learn. I wasn't sure at first about the mechanics, but I really liked rolling dice and placing them based their values to get resources, colonies, more ships, etc. The board is very nicely laid out with great graphics / icons to help keep the game running smoothly. Really liking this game. I love the retro feel and art of the game. I think this is solid. Great game! Dice playment along the lines of Castles of Burgundy and Troyes. Great game!